The Institute of Astronomy is open every Wednesday evening 7 - 9pm during the Winter season. Entrance is free, and there is no need to book -- unless you are a group of over 15 people. Our public open evenings are on summer hiatus, and will re-start in October 2019. Doors open at 6:30pm, and an astronomer will present a half-hour public talk, starting at 7.15pm. This is followed by an opportunity to look through the historical Northumberland and Thorrowgood telescopes if the weather is clear. 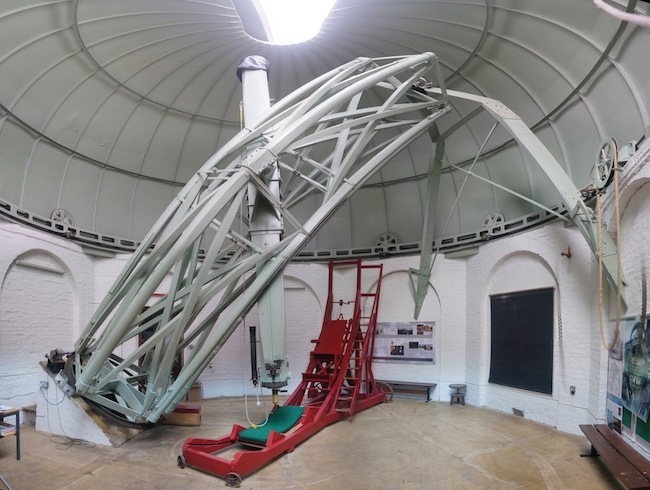 Members of the Cambridge Astronomical Association also set up modern telescopes on the observatory lawns, with video projection facilities and expert commentary. We can't always guarantee observing, of course, as it is very weather-dependent. On a cloudy evening, the talk will instead be followed by tea and biscuits, and some short entertainment from the CAA. Seating in the lecture theatre is available on a first-come, first-seated basis - if it's full, we'll do our best to seat you in an overspill room, where the talk will be live-streamed. We also archive the recordings, so you can watch the talk online at a later date. If you wish to skip the talk and only attend the observing, please arrive at 7.45pm (don't arrive before this, as we'll be still setting up!). Observing can sometimes be cold, so remember to wrap up warmly! You are welcome to bring a torch to help you find your way about the site; but if so, please wrap up the end in something seethrough and RED (such as a transparent sweet wrapper) so you don't lose your (or anyone else's) night vision. We have maps showing how to find the IoA. There is plenty of parking available, with 3 car parks along Madingley Rise. Please allow a little time for finding parking and walking back to the IoA; you can always drop off people at the main entrance before finding parking. Please do not park along the verge or pavement on Madingley Rise. Children are very welcome; but please be aware that not all the talks will hold their interest for 30 minutes. Please look at the talk schedule to see which might be particularly suitable for a younger audience. Alternatively, it's always possible to sneak out during the talk and look at the pretty pictures around the department instead till the observing begins. Small groups of people (ie 15-25) are welcome; however, we have to limit such groups to only one per session so that we can retain the 'drop-in' public nature of the evening. Look at the season's schedule to see which evenings still have a space for a group booking and please get in touch with Dr Matthew Bothwell. It may be possible to accommodate a larger group at a separate, private vewing - if you are interested in this option please submit a group booking request. The building, lecture theatre, outside floor show and one of the two historical telescopes all are wheelchair-accessible. There is a disabled parking place next to the front door at the left. Please get in touch with Dr Carolin Crawford if you have any specific concerns.